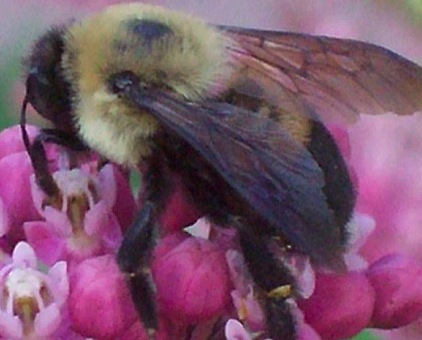 Bumble bees refers to a species of social bees that are larger than honey bees, but are slightly smaller than carpenter bees. These bees have an abdomen covered with yellow and black hairs. There are approximately 50 known species of these in North America, today. The Gold Northern ones are typically found in central or southern Arizona regions. They only survive in warmer climates. The queen bee typically raises her brood in a small underground colony and feed them with clumps of nectar and pollen. The queen bee only stays in a colony until springtime and then finds a new colony They will not typically pollinate the same flower as another bee. It will sometimes also steal pollen from a flower without pollinating it. They don't hoard honey as honey bees do; instead they store it in cells located in their colony.